She was born somewhere in the Sulawesi Sea, on board a balangay, an ancient wooden boat, or at least, a replica of it. Her parents had built it together with some friends, with the help of an old boatmaker from Sibutu Island to sail around the world. It explained certain things about her, like her name, Sula, but not others, like why her skin was the colour of molasses. Sula’s Voyage is just that – a journey, but not only for Sula, but for the reader, too. Through her roller-coaster journey, I lived vicariously through the wondrous girl who is Sula, her being my age exactly in this novel. When I was approached by Catherine Torres to read this novel, I was immediately excited: never before had I read a novel based in the Philippines, and – I soon discovered – never before had I read a novel packed with so much culture. From the food, to the locations, to the cast of characters, everything about this novel provided an insight into lives thousands of miles from my own. I learnt so much about the Philippines and its culture just in the first few pages, and loved learning even more as the story progressed. What’s more, being exposed to so much new information was eased with the help of the glossary at the back of this novel. It was there I discovered more about traditional Filipino foods, colloquialisms, and even modes of transport, as well as the Spanish history of the islands. Honestly, I was impressed at the amount of thought and planning that had clearly gone into the novel. Similarly, the descriptions of the locations and foods in this novel were impeccable: I could imagine myself exactly in Sula’s spot, just as I could imagine sinking my teeth into the food she was describing. Frankly, my mouth was watering so much, I had to be eating something when reading this book lest I become too hungry! Likewise, I adored the character of Sula – she was strong-willed, determined, and so very sure of herself; I believe she is the perfect female role model for adolescents, and I aim to be just like her; throughout this book, her strength consistently shone through, even when all odds were against her. As her story progressed, Sula always managed to remain in control – despite the array of unexpected truths being brought to light before her – and I loved that this novel focused on such a spirited girl. Overall, as is abundantly clear, I really enjoyed this novel, my only criticism being that I wanted more than 226 pages (I call for a sequel! ), explaining as to why I awarded this novel 4.5/5 stars. No wonder it was shortlisted for Scholastic’s Asian Book Award in 2014! If you’re interested in reading this novel, head over to Goodreads, who are hosting a giveaway of this book – click here to check it out! Entries close on 28th June 2016 so be quick! 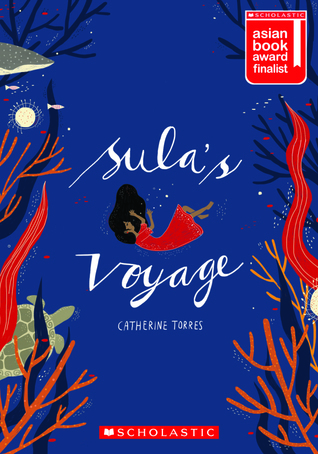 Sula’s Voyage is set in the Philippines in Asia, a continent very far from home for me, and so I am entering this novel for the number 2 spot on the Around the Year in 52 Books challenge: A book set in a different continent. Yay! The cover for this book is fantastic. Your review is really pushing me to read this, especially because of the rich culture that you were referring to. Sounds like a great read. I most definitely will 🙂 Thanks for the recommendation!